Busy day yesterday. I brewed the 5 gallon batch yesterday and it was a hectic effort. I did not dive in and do an all grain recipe….. my CFO would need to authorize a $600 investment in mashing equipment…maybe a little more depending on the quality. This was a partial grain batch and the grain bill was pretty heavy – 2.5 lbs of 2-row pale malt, 7 ox. of crystal mall 80 (L), 9 oz. of Briess black malt 550 (L) – the black malt really gives it a dark look. I also added 3.15 lbs. of Briess light extract and 1.5 lbs of dried malt extract. I used severla of my dear’s kettles and had to be a little creative to rinse the grains. Magnum hopsused for bittering and Mt. Hood hops for aroma – the Mt. Hood hops have a great aroma! Dry English Ale yeast, pitched at 74 degrees and aerated well. A day later there is a good krausen ring around the edges of the fermentation bucket indicating the fermentation is well underway. I should be ready to bottle in two weeks and enjoy for the Thanksgiving Holiday Season. I ran a taste test on the sample I pulled to check the OG(original gravity) and the color matches up with the recipe – about a 28 on the SRM scale vs. a 35 or more for my Stout. The taste is nice… not sure how it will mature after it conditions. Folks in the Northwest rave about the beer so I am anxious but willing (need) to be patient. For you folks in Houston…. some good beer news. We have a new brewery, Karbach Brewing Co. The Brewmaster is well seasoned… looks like the Houston Chronicle mixed his name up with the Brewery name in the article… oh well, Eric Warner has somegood roots and spent time with Flying Dog as the CEO…. I like the Flying Dog offerings and the irreverent humor expressed through the artwork on their labels. The article touts Karbach’s “Sympathy Lager”….. and now the hunt begins. Hey hun….er, Ms. CFO – how about a good sized refrigerator for the garage so I can brew some Lagers….. I found a great article for clone lagers like Hamms and Oly…..real classics…how about a real good MGD? Maybe I shouldn’t press my luck. 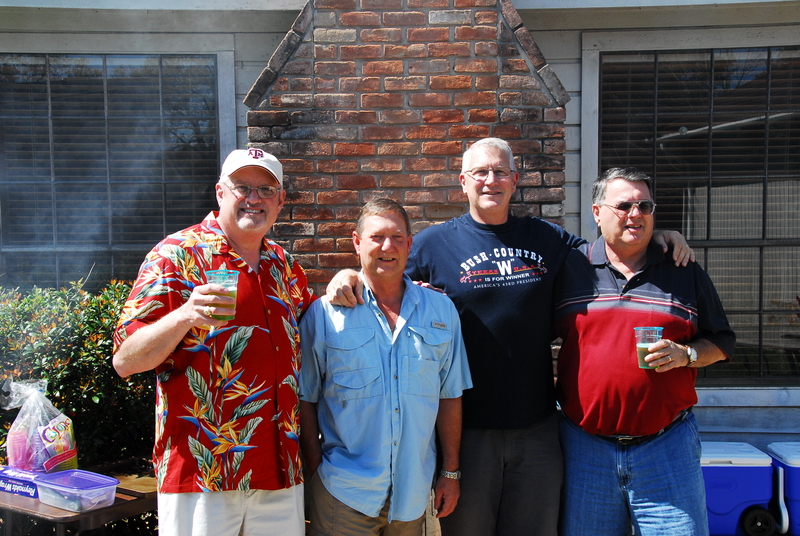 The Photo below was taken on my 60th birthday – Pat Love – We named a Wheat Ale we brewed after him, John Livezey, my partner in crime at the Humble Beer Festival ( the H is silent in Humble), me.. looking good in that Bush t-shirt and a non-brewing neighbor Alan Wooten…. he did a little quality surveillance for us. The Belgian Wit was a hit at dinner tonight. My daughter Ashleigh had a friend over and her review of the beer was pretty spectacular… head swells, chest puffs up and I grin like the Chesire cat…. I do love to hear nice things! Many new and even 3 day old start-up breweries were plying their marvelous concoctions. My primary interest was to assess how some of my recent efforts stacked up against the professionals. And yes maybe just drink a few as potential brewing candidates. I think my brews compare well! Hooked up with a local brew club here in Kingwood, TX so my brewing knowledge will continue to grow. The batch of wheat ale made for Lindsay Waterman went sour due to….. just my guess, cat dander from my wife’s cats. We rebrewed, is that a word – I guess now it is, and I bottled it yesterday. The sample pulled prior to bottling to check the gravity was might tasty! tonight I boil a new one for my daughter Lisa. She asked for a special brew that her friends from the band ‘Downfall 2012″ to take on their summer tour. I will try to replicate the recipe I shared in an earlier post. The only change I will make is to dry hop an ounce of the Amarillo hops. So, why mess with a good thing…. just to see if we can make it better. I will not send the full 5 gallons out with the band….i willjust keep some brew to replace the sweat I lose in the brewing process.